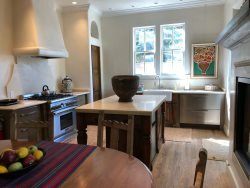 Fabulous location – this two bedroom downtown property is close to renowned Canyon Road as well as the historic Santa Fe Plaza. It’s at the end of a small, four unit gated compound. 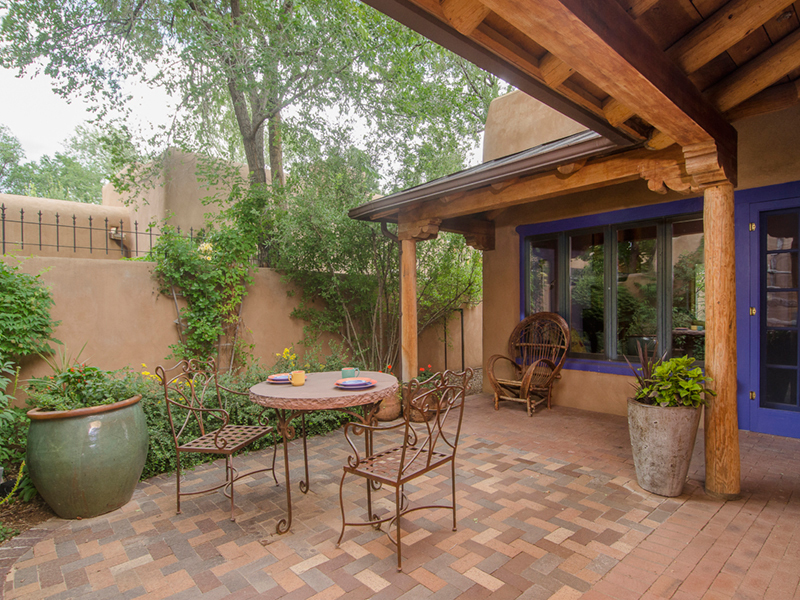 Quiet and privacy await you at Santa Fe Treasure! Enter through the custom gate to a walled in front patio with fountain sculpture. The downstairs opens up to a great living space with formal dining for up to eight guests in the dining room with fireplace. 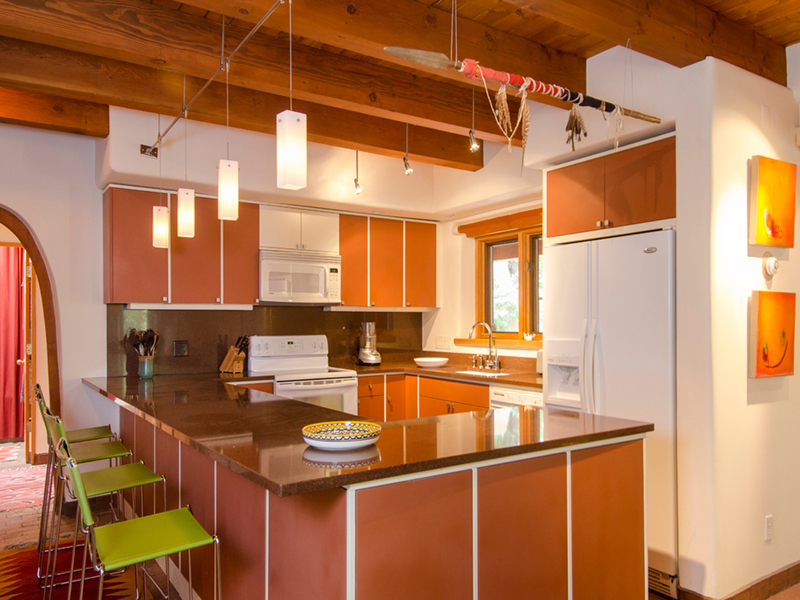 Or you can relax at the kitchen counter and have breakfast at the granite counter with comfy leather barstools. The living room has a kiva fireplace and comfortable leather couches where you can relax and watch TV or listen to music. From the living area you can look at two glorious gardens, one has patio table and chairs. The downstairs Queen Bedroom suite has a full bath, fireplace and opens to the patio. Upstairs is the spacious Queen Master suite with fireplace, bath with double sinks and walk-in shower. A complete office is located beside the bedroom. The home is very quiet and within walking distance of the plaza. Its very well maintained with a brand new large office on the second floor. 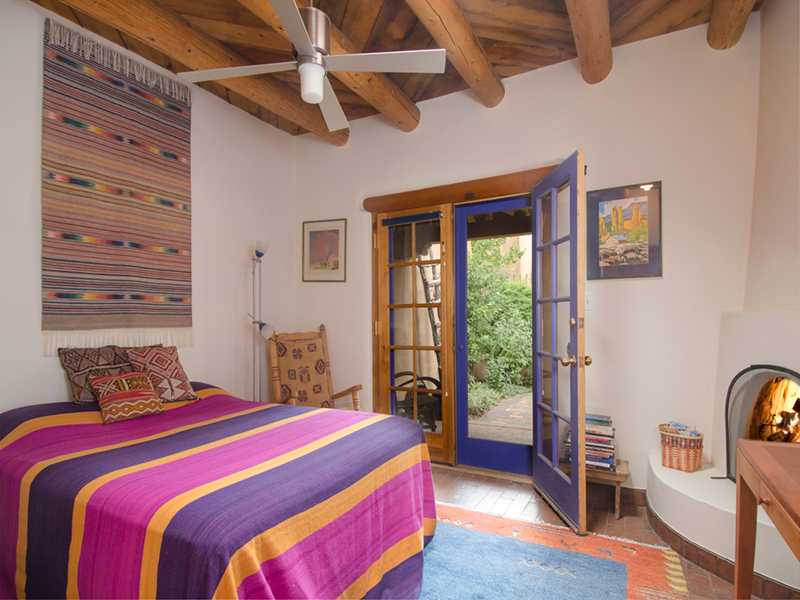 This property is perfect if you want a hideaway that's also close to the middle of Santa Fe. Adobe management is always right there if there any issues with the property.